At the last PoSobota meetup, David Grudl introduced the news waiting for us in the version 2.4 which should become the LTS in Nette version 2. There are big plans with Nette version 3, especially regarding PHP 7, therefore the version 2.4 should most likely be the version for all Nette 2.x projects to stick to for good, thus the prolonged support. As of today, the minimal support of each .x version is 2 years, prolonged by at least a year in the LTS version. Summer is coming! (pun intended) and the planned outing in the open is coming with it. You can pre-register at www.nettecamp.cz. Together with Tomas Jacik, we are preparing many new things and we will try to overcome the obstacles exposed by last year’s 0th Camp. The date is 25 – 28 August 2016 and we are moving the venue to Český ráj. Our Czech mailing list community already counts more than 600 subscribers. It is a shame that we are not able to gauge the exact count of newcomers who decided to read this actual post. But I believe that this number is going to rise at least as fast as the Czech, local one. A new patch version of Nette Framework has just released. It brings a few novelties that may be found at https://forum.nette.org/…3-9-released. I cannot leave out, at least, one of them – it is now possible to turn off the Tracy by Debugger::$showBar = FALSE; The last stable versions (2.3.9, 2.2.12 and even 2.1.12) are fully compatible with PHP 7 and, as a bonus, version 2.3.9 is able to get use of PHP 7 features as argument type hints and a return type of a generated factory. This article is a shortened translation of a Czech e-mail magazine. Honza started with writing some news from our community and foundation. Because we want to talk to you, no matter where you are, we have also turned this e-mail magazine into a blog post. We are planning a new article delivery in every 2–3 weeks. However, a brief delay might occur depending on a translation speed. If you'd like to help us with a content and/or corrections, contact Honza for more information. We are open for any help. This Twitter hashtag stands for small repeated events and casual community meetings. An English equivalent, #NetteFwBeer, will also be used. These casual meetings take place every second Wednesday in a month. If you'd like to set up your own local community event, just create an event at http://eventle.com/(or elsewhere) and promote it on a Nette forum. We want the community to grow and this is a one of the ways how we are able to make it happen. Nette DI (Dependency Injection Container) is one of the most interesting part of Nette Framework. It is compiled, extremely fast and easy to configure. Let's have an application for sending newsletters. The code is maximally simplified and is available on the GitHub. In the survey Best PHP Framework for 2015 organized by the magazine SitePoint Nette takes amazing 3rd place. Thank you for your votes! I am pleased that the users are satisfied with Nette. 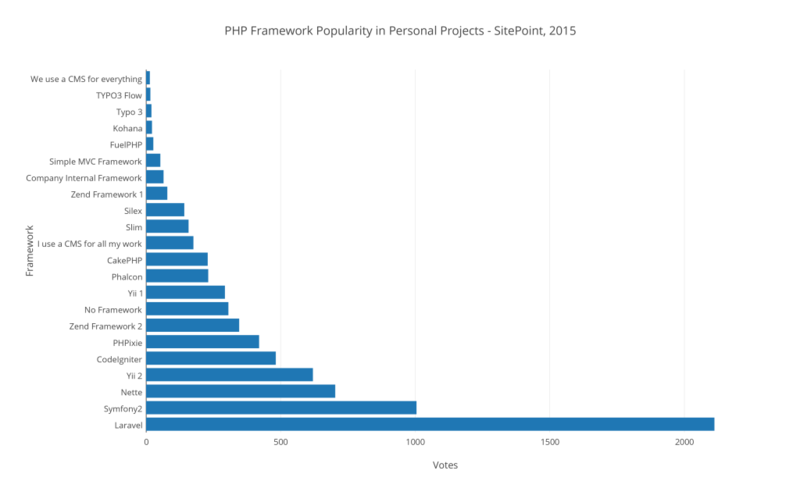 It is also interesting how a large number of PHP frameworks are actually used and that there are still many people which don't use any framework.